For some, home is merely a place to lay one’s head. It’s a place to return at the end of a hard week, a place to eat and sleep, a place for mundane routine that may not vary day to day. It is just a space in which existence happens. 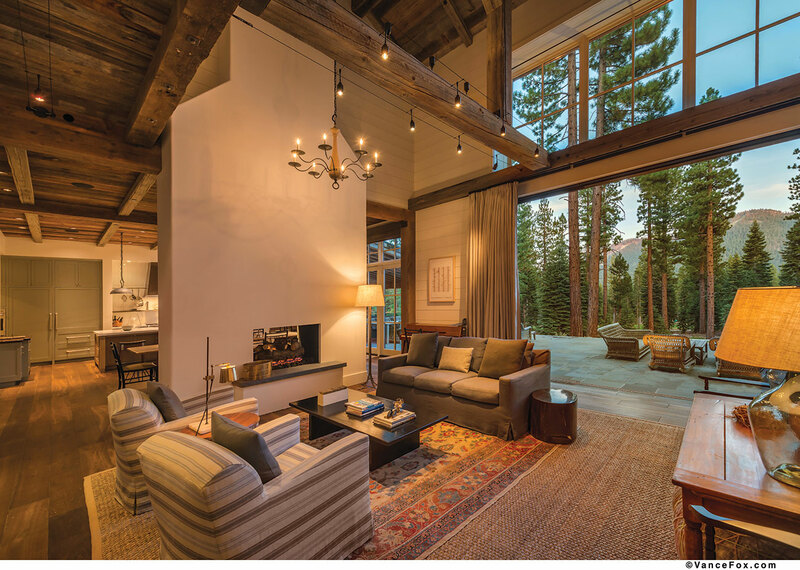 For the owners, who prefer anonymity, designers and builder of this spectacular Martis Camp farmhouse, though, home is a concept—of family, of comfort, of shared time together with loved ones and friends. 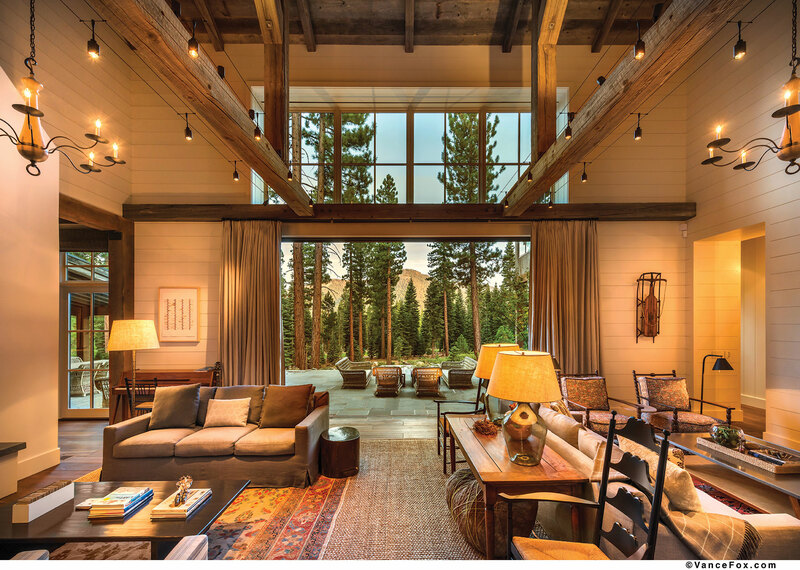 The owners wanted a modern New England–style farmhouse, a departure from the traditional Tahoe or ultra-modern homes found in the Martis Camp development, for their family’s mountain retreat. The bulk of the dark-stained exterior sits between two ends finished in reclaimed wood siding. A deliberate lack of exterior window trim adds to the barn aesthetic. “If you look at the structure you can almost imagine you were coming into a barn, and that everything was just brought up to 2014,” says Heslin. 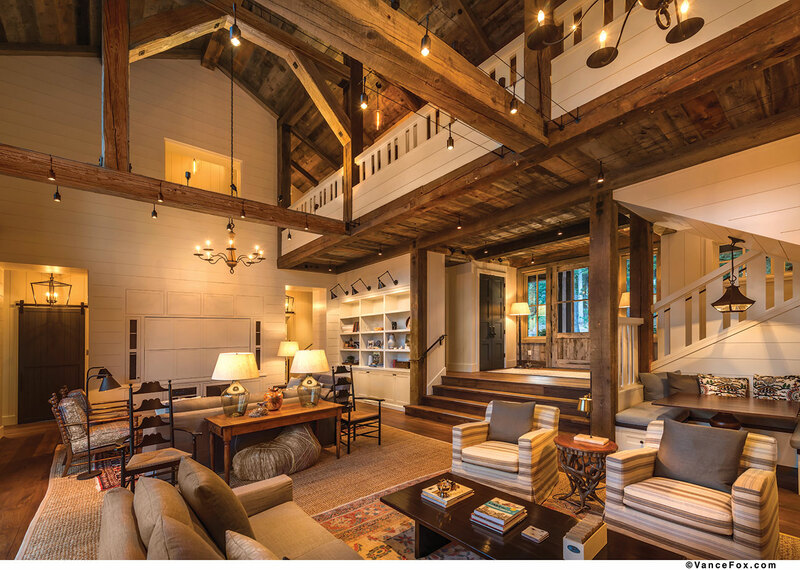 The interior is likewise intended to look as if a Vermont farmhouse had been remodeled, bringing the best of old and new together in a project that is entirely unique. The entryway for the home sits a few feet above the living room, ensuring that visitors will be greeted warmly with a spectacular view of Northstar California and the striking evergreens surrounding the lot. Massive windows and Wieland doors pocketing into the wall create not just a view but also an experience of the mountains. With the stunning scenery outside and a relatively secluded setting, an exterior fireplace was the perfect detail to add to the outdoor living concept. For a 7,500 square foot, six-bedroom home, not one room feels ostentatious or overly grandiose. Rather, design choices—such as the mixture of reclaimed barnwood and white paneling, comfy fabrics and a variety of rustic and refined elements—have ensured every nook and cranny feels stylish yet inviting, polished yet comfortable. This is where colonial New England–style meets modernity in a sophisticated, complementary manner that heightens the overall design. No matter the size of any one room, details like oversized floor-to-ceiling curtains soften and bring the scale down to a manageable size, says Los Angeles–based designer Matt O’Dorisio. Emphasis was placed on designing the home around the open two-story gathering space to showcase the reclaimed timber structure, Walton says. In the living room, two separate sitting areas add an intimacy to the large great room. 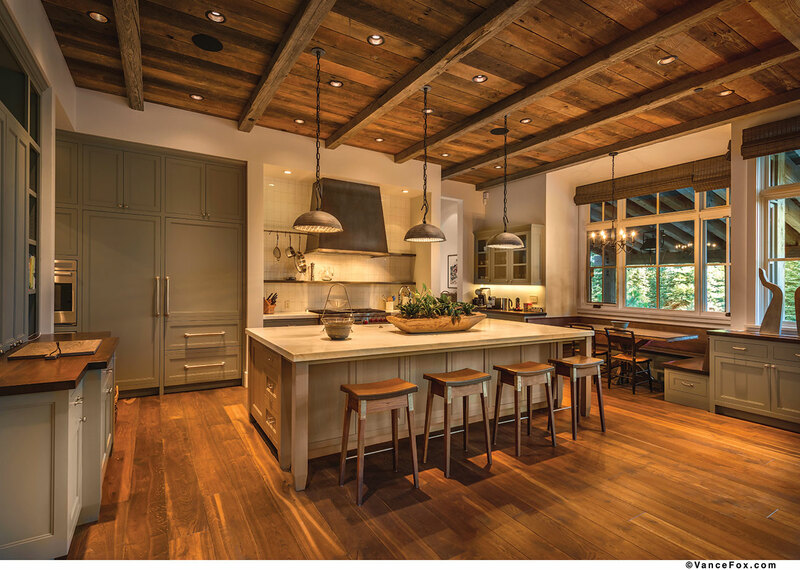 Reclaimed wood from grain elevators in Montana create warmth and rustic charm. The living room’s bright, high ceilings harmonize with a truss design that developed as the project moved forward. 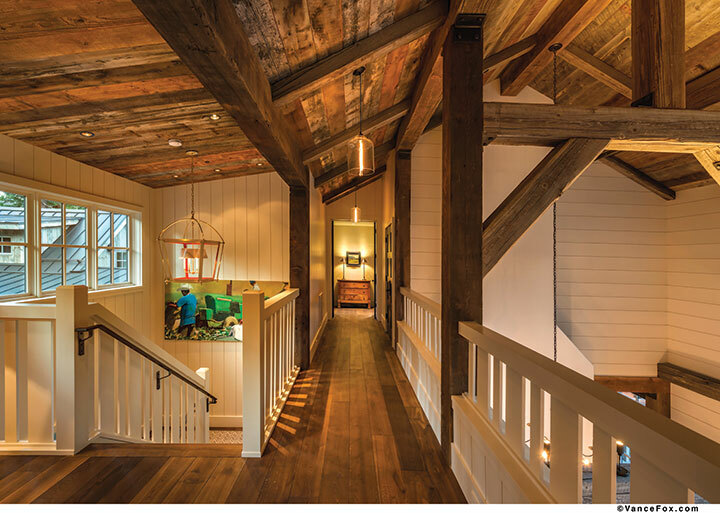 An open bridge in the living room serves as a callback to what might have been a loft in a barn. “It just feels very big and open; I’ve been told the house feels smaller than it really is; it doesn’t feel like this massive, overwhelming structure,” says Heslin. This modern farmhouse was a unique project for each member of the team. 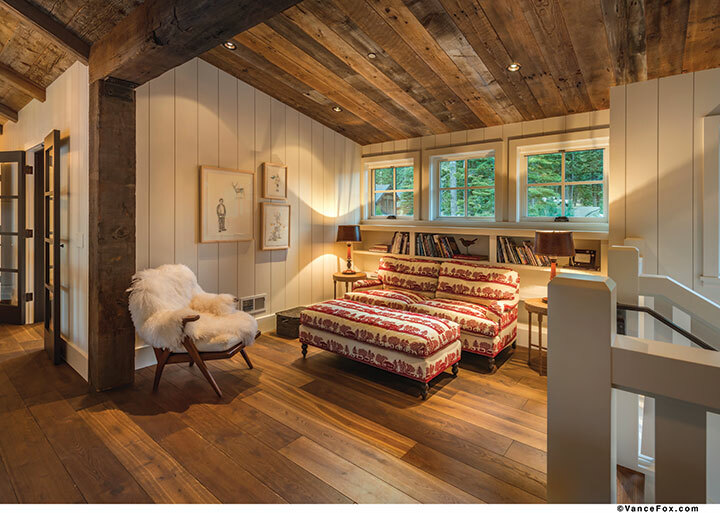 Creating a space reminiscent of the East Coast without creating a coastal feeling required attention to details and finishes that would guarantee more of a cabin or mountain character. The white paneling, typical of beach cottages on Cape Cod or Nantucket, was tempered by the more muted color palette, organic or mountainous fabric choices, and roughness of the reclaimed wood. Soft, inviting materials were selected throughout the home. “We were really into making sure everything was incredibly comfortable,” says O’Dorisio. A dedicated art room lies behind barn doors (fitting) to the right of the living room. Everything from a built-in pop-up sewing machine to a full painting setup, smocks and all, can be found here, as well as a custom stainless steel sink. With crafts and art projects for both kids and adults, the room is perfect for stormy days. While the art room is suitable for all ages, the kids’ bunk rooms were created solely with children in mind. “The boys’ bunk room is really fun because the bunk beds are train-style, where they have cubbies for their bunks and curtains,” says Heslin. Each “berth” has a full bed, and for good measure there’s a trundle bed and day bed at the end of the room, too. The boys’ bunk bath features two showers and an open vanity with three sinks for more of a refined camp-style approach. “Every room is really its own special area, so we tried to be a little bit different everywhere,” says Heslin. “There’s a level of consistency but every room wants to be special.” This is apparent in the difference between the boys’ bunk room, with its deep, forest green colors, and the girls’ room, which features lighter finishes and more feminine detailing. Each bedroom and bathroom throughout the home has unique touches but a unifying style of colonial farmhouse modern, from the mullion windows—rare in Tahoe nowadays, especially in modern homes—to the sleek light fixtures that put an updated twist on the traditional. Painted doors and trim, typical of New England, add a fresh lightness to the home. A muted yet warm color palette with occasional pops of rich color tie the floor plan together, and traditional, handmade subway tile in each bathroom creates a consistent aesthetic and serves as a reminder of the days when materials were made by people, not machines. “It gives that craftsman feel versus something that feels like it was just cranked out by a factory,” says Heslin. The beauty is in the imperfections. The master bedroom features His and Hers master baths—his, a clean and elegant masculine room featuring tight ledgestone tiles and aged brass; hers, an airy feminine space with a freestanding tub, gray subway tile in a herringbone pattern, light finishes and, naturally, the larger of the two walk-in closets. On the first level, off the kitchen, is the guest master bedroom, designated as the owners’ parents’ room. “She wanted them to feel like they had their own space and feel as at home as [the owners] do,” says Heslin. A large space with tall mullioned windows—originally earmarked as an outdoor balcony—contributes to the indoor/outdoor feel and creates space while adding function. A built-in hot tub and traditional marble countertops (rather than Tahoe granite) in the guest master bath prove once again that no detail was too small and nothing was overlooked. “The details make the house,” says Heslin. The kitchen features more marble and butcher block countertops, with a bright, lovely breakfast nook surrounded by windows and dancing sunbeams. Industrial light fixtures, hanging pots and pans, and open shelving recall open, farm-style kitchens. Painted steel cabinet doors and leather pulls adorn a built-in dining room hutch. In the butler’s pantry, a library ladder allows access to the highest shelves. As if it were a period at the end of a sentence, one last detail ensures future visitors will understand what is truly important in this home. Near the center of the action, inset in the floor just shy of the foyer steps, resides a round stainless steel seal. 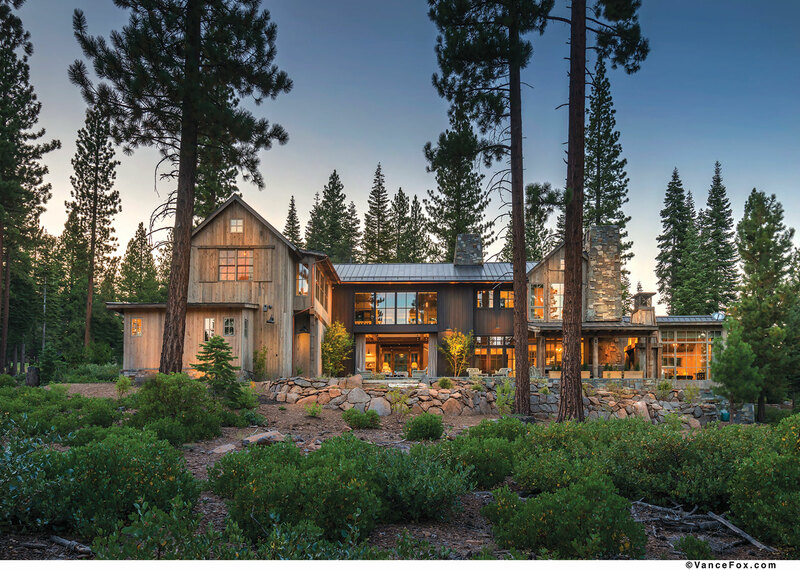 It features Lake Tahoe, orientated to true north, with the elevation and coordinates of the home, the year it was completed and the family crest—a visual reminder that Tahoe and family are at the heart of this home.